The Malaysian national carmaker Proton in collaboration with Al-Haj automotive will set up the first overseas completely knocked down (CKD) plant in Pakistan which is expected to start the production by June 2020 with its model Saga. 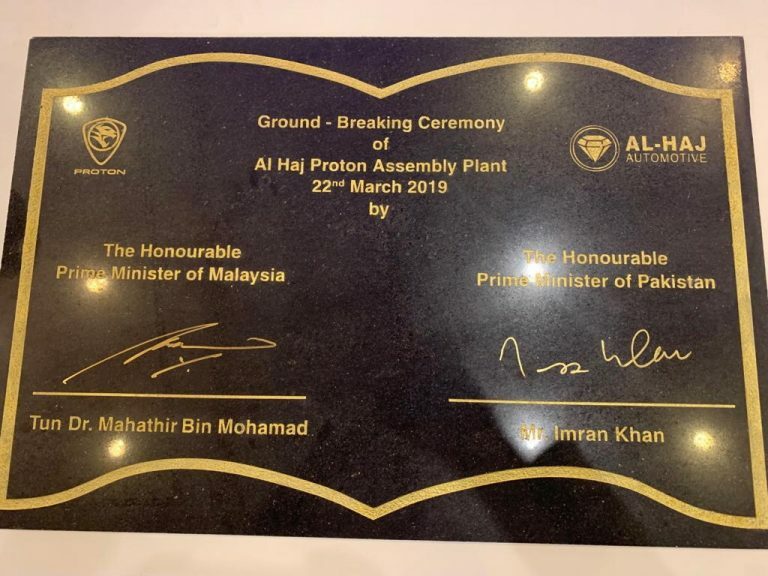 The event of the ground-breaking symbolic ceremony of the plant took place on March 22, 2019 that was officiated by the Prime Minister of Pakistan Imran Khan and his Malaysian counterpart Mahathir Mohammad. 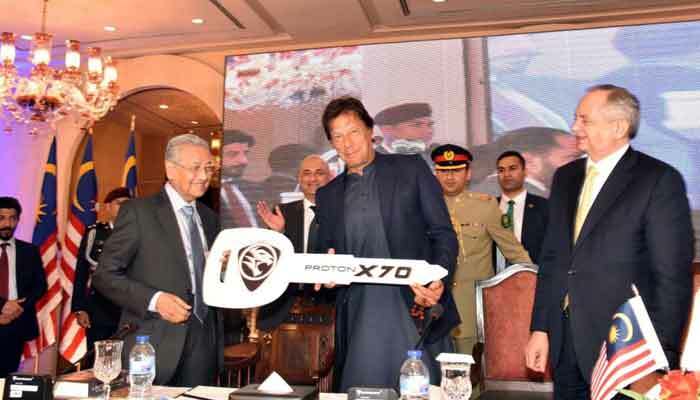 The Malaysian PM also gifted Proton X70 SUV to Imran Khan on this occasion. The Chairman of Proton Datuk Seri Syed Faisal Albar was also present at the event who believes that this initiative could result as a gateway for the company to penetrate other countries as well. While speaking to the Malaysian media after the ceremony, he said that the company is keen to implement its export strategy which involves keeping an eye on the countries which hold multi-trade agreements with other nearby countries. According to the agreement, Al-Haj would be the official distributor of Proton vehicles in Pakistan. The local auto manufacturer will also build a CKD plant in Karachi with an investment of $30 million. According to Chairman of Proton, the company has repositioned its export strategy and now plans to target important automobile markets with a long-term investment purpose. The new export strategy also involves assembling of cars in the local market instead of sending completely built units (CBUs) of vehicles. It’s certainly a significant step towards creating job opportunities in the country of investment. He quoted the example of partnership with Pakistani automotive group in this regard where the joint venture would help in creating nearly 2000direct jobs within the first three years of investment. Proton aims to leave its footprint in the automobile sector of Pakistan by creating as many as 20,000 jobs. The company also selected Pakistan as its first location for a CKD plant because it believes that the auto market has a huge potential of growth in the future. The trend of new entrants making their way into the local industry of Pakistan is on the rise ever since the government announced its Automotive Development Policy (ADP) 2016-21 which offers several incentives to the new players. Proton is also looking to grab the opportunity to take a competitive advantage before the market saturates with too many new auto manufacturers. Currently, not many global auto brands exist in Pakistan which encourages new investments in the sector wholeheartedly. Moreover, there are 17 cars for every 1000 people in Pakistan which shows there is a considerable amount of growth margin in the local industry. Proton was established back in 1983, and since then it has been able to sell more than 3 million cars. The company already operates in more than 25 countries worldwide which includes Australia and Singapore. As far as the structural plans of Proton are concerned, the company is looking forward to staring its production from June 2020. The auto manufacturer will be targeting the production capacity of 25,000 units in the first year of its operation. Proton has a clear plan of introducing its Saga as the first model in Pakistan. 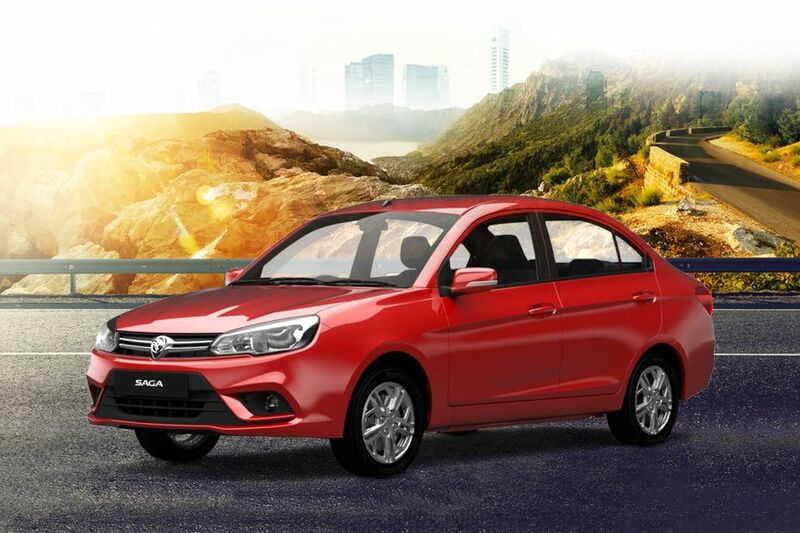 The reason behind introducing Saga is the company’s strategy to position itself in accordance with the tax structure incentives in Pakistan which is different for cars of 1600 cc and above engine capacity. As Proton Saga would be featuring an engine of 1500 cc and below capacity, it would greatly fit in the local market. Furthermore, the company is also researching on consumer behavior in Pakistan as there are certain models which may have a massive response in Malaysia but fall apart in the auto industry of Pakistan. The company believes that Karachi is an ideal place for building its manufacturing plant as it is considered as the center of the automotive industry in the country.